The global South Asian diaspora has received much academic attention in recent years. Many insightful books on the subject have been published, and countless articles and conference papers have been devoted to this issue. Nearly all of these publications have focused either on a single South Asian community in a certain country, or on a unique period or experience in the history of South Asian migration, or on a specific issue or problem within the diaspora or in its relationship towards their new homelands or towards India, Pakistan, or Bangladesh. Very few books have taken on the gigantic task of a general overview, and where they have done so, they tend to follow the issue country-wise by examining the South Asian diaspora in the United States of America, in Great Britain, in Mauritius, and so on without necessarily connecting the case studies by a theoretical model. Examples include the still rightfully highly praised Report of the High Level Committee on the Indian Diaspora (New Delhi 2001) or, more recently, the Encyclopedia of the Indian Diaspora, edited by Brij V. Lal (Singapore 2006). 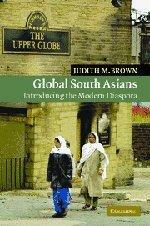 While these approaches have been useful sources of facts and data, they mostly lack a broad overarching effort to explain, understand, and predict the dynamics of South Asian migration and diaspora formation – which is exactly what the new book by the acclaimed British historian Judith M. Brown, Global South Asians: Introducing the Modern Diaspora, attempts to do. According to Brown, becoming a diaspora, and particularly a successful one, is a “long-term business” (p. 29) and hard work. Migrants face three different tasks that have to be fulfilled in order to form a lasting diasporic community: Firstly, they have to “establish new homes, social networks and communities” within the host country. Secondly, they have to “relate to the public space and life of their new homeland”. Finally, they have to define and re-establish their “connections […] with their old homeland” (pp. 173-174). While the first task relates to the establishment of an “economic base” (p. 60) and, thereby, functions as a necessary but in itself not sufficient precondition to the following levels of diaspora formation, the second step may also be described as social integration, while the third assignment clearly has political implications. With this theoretical model, Brown has a tool for describing and analyzing the global South Asian diaspora without limiting herself to one or two case studies. However, many of her arguments naturally stem from the South Asian experience in the United Kingdom, which at times contradicts the self-set objective of a general overview. Before applying her theoretical model to the South Asian diaspora, Brown describes the general historical context of her study. In the first chapter, “Stability and Movement”, she explores the traditions of migration on the Indian subcontinent and draws broad lines from pre-colonial times to the age of British imperial rule to the new opportunities after independence. Brown describes the causes and forms of traditional and modern internal mobility in South Asia (pp. 12-19), including the “imperial movement” of people within British India. Reasons for and varieties of outward migration and external mobility are the topic of the second part of this chapter (pp. 17-27). The following section, “Making a Modern Diaspora”, broadly assesses this outbound movement. Brown distinguishes several flows of migration within two eras: In the “age of empire”, a colonial diaspora was established with the system of indentured labour (pp. 30-34). Later, contract labourers under the kangani-system followed (pp. 34-35), while the relatively free movement of so-called “passenger Indians” formed the third wave of outward migration during that period. The second broad era, “decolonisation and globalisation”, spans from the days of independence to the beginning of the 21st century. An initial important migration movement brought many South Asians to the United Kingdom, mostly via “chain migration” (pp. 40-45). The “twice-migrants” from Burma, East Africa, Surinam, and other countries represent the first significant relocations within the South Asian diaspora (pp. 45-50). From the 1970s on, numerous Indians, Pakistanis, and Bangladeshis went to the Middle East, forming a large guest worker community but not necessarily constituting a settled diaspora (pp. 50-52). Finally, the current era of accelerating globalisation encouraged the migration of skilled and educated South Asians to the rich countries of the western world (pp. 52-57). After these very useful introductory remarks to the overall formation of the South Asian diaspora, Brown turns to her model of different consecutive tasks a diaspora needs to fulfil in order to establish itself as a lasting and successful community. Here, the first phase of establishing an economic base in the host country is definitely the most important one, since it is a necessary prerequisite for any further development. Hence, the chapter dealing with this early stage of diaspora formation, “Creating New Homes and Communities” (pp. 59-111), forms the quantitative and qualitative heart of Brown’s study. According to Brown, three variables are of prime importance to the possible economic success of diasporic migration: The nature of the host economy (agricultural, industrial, or post-industrial), the education and skills of the migrants, and their “initial socio-economic status” (p. 61). The South Asian indentured and contract labourers of the 19th and early 20th century were mostly unskilled workers who were employed on plantations in largely agricultural economies (pp. 62-67). Their status was extremely low, which limited the opportunities to become economically independent after the contract requirements were fulfilled and, consequently, left many of these labourers in harsh economic conditions and forced them to remain in what Hugh Tinker accurately described as a “new system of slavery”. In contrast, the Indian and Pakistani (and later Bangladeshi) migrants who came to the United Kingdom after World War II were free people. They came from rural middle-class families and had at least some basic level of education. Furthermore, they could rely on small financial resources which helped many of them establishing themselves successfully in the urban-industrial host economy (pp. 67-73). The skilled South Asian migrants of the late 20th century had and continue to have much better capabilities to succeed and prosper in complex modern economies (pp. 73-74). Their education and qualification makes them highly adaptable to the challenges of globalisation. Parallel to the creation of an economic base South Asians construct diasporic networks and communities which often lead to the establishment of “ethnic enclaves” (p. 78). Social networks form an “emotional home” (p. 76) and fulfil many practical functions such as supplying goods and supporting cultural traditions (p. 80). They are created and reinforced by ties of kinship, neighbourhood, and marriage and also relate to institutions of “gift giving” and caste imported from the Indian subcontinent (pp. 81-87). Religious networks can be a source of both linkage and division among the South Asian diaspora (p. 93). The reinvention of religious and cultural traditions and their adaptation to the new situation can form a strong bond within the diaspora (pp. 97-102). In particular, the construction of temples has served many different functions and is of paramount importance to the formation of South Asian diasporic communities (p. 103). The question of integration into host societies is the topic of the next chapter, “Relating to the New Homeland”. The oftentimes problematic relationship between ethnicity and national identity among South Asians in the diaspora can be traced back to the era of colonial control. Labourers from British India who were brought to all regions of the Empire faced severe problems after their host countries gained independence. Being denied Indian citizenship, they often were subject to strict regulations, discrimination, and even expulsion in their countries of residence, which lead to waves of “twice migrants” from Malaysia, Guyana, and East Africa (pp. 114-117). In the western world, South Asians have experienced integration as well as segregation. Whereas particularly Indians are a natural part of the “American dream” in the United States, many South Asians suffer from ethnic discrimination, institutionalised racism, and harassment in Britain as they are perceived as a threat to the British national identity (p. 121). Consequently, South Asian “realities” include economic success and social deprivation, successful political participation and problems in areas like health care and education (pp. 124-137). Within the often difficult framework of finding an economic, social, and also emotional place in the host society, South Asians are confronted with the third task of the theoretical model of becoming a successful diaspora: “Relating to the Old Homeland”, the last chapter. Early diasporic flows had been largely “cut off from India” due to poverty and poor communication structures (pp. 149-150). They experienced an isolated and self-centred development. For them, “India” was a myth rather than an actual reality. The later, “modern” diaspora benefited from technological advancements (pp. 151-153). Internet, e-mail, and cheap long-distance telephone connections have made contacts to the old homeland easier, while convenient and affordable air travel has opened the door to regular visits. Hence, the contributions of the diaspora towards India, Pakistan, and Bangladesh have been increasing in recent years: Remittances and “diaspora money” has helped many regions on the subcontinent by providing better infrastructure, better education, or better health care on a private level (pp. 154-157). Especially India has furthermore profited from charitable investment on a public level. Social, educational, and health programmes are financed by the diaspora, which is also very active in the area of disaster relief (pp. 157-158). Furthermore, the South Asian diaspora has become more involved on the subcontinent on a political level. Conflicts in Kashmir and Punjab have been among the issues South Asians abroad have put on their agenda, supplying financial and organisational resources (pp. 160-163). The global hindutva-movement has generated much support in the diaspora with consequences relating back to India (pp. 164-169). However, Brown does not acknowledge the efforts of the Indian diaspora to further New Delhi’s foreign policy, particularly in the relationship towards the United States, an area which will likely become even more important in the future. Overall, Global South Asians: Introducing the Modern Diaspora is an insightful introduction to the South Asian diaspora. It offers a wide range of knowledge brought together by a theoretical model that is both sophisticated and easy to grasp. This model is convincingly applied to the South Asian diaspora. Most of the arguments, however, stem from the experiences of Indians, Pakistanis, and Bangladeshis in Britain or, to a lesser degree, in the United States. Large portions of the South Asian diaspora in South Africa, East Asia, or the Persian Gulf area receive only little attention. Furthermore, some of the facts and figures used are outdated, particularly concerning the Indian American community. Nonetheless, Brown has written an outstandingly readable book which should not be missed by any student of the South Asian diaspora.